As we briefly mentioned in one of our development updates a few months ago, we have been gearing up for our first optional paid content launch. Now we’re excited to tell you what it’s all about! 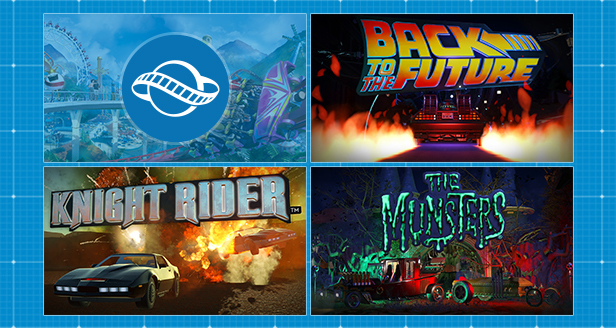 As of today, we’ve added three new downloadable content packs for Planet Coaster, featuring the DeLorean Time Machine from Back to the Future, the K.I.T.T. and K.A.R.R. vehicles from Knight Rider, and the Munster Koach and DRAG-U-LA vehicles from The Munsters. Each of these kits include special themed karts and components for your Go-Karts, as well as different scaled pieces for you to construct creatively (specific info below)! Each kit also contains the ready-made blueprint for the vehicle specific to that content pack. Please note that each Construction Kit is completely optional for you to purchase! We’d love to see them appear in the game to see what you can do with them, and you will be supporting the Frontier team with the development of Planet Coaster. The kits are available now and sold separately on both Steam and the Frontier store for £1.99 ($2.99, €2.99)* each. See below for details on what each kit includes! Should you have any more questions regarding these additional content items, we’ve prepared an FAQ for you! Thank you for your ongoing support; we can’t wait to see how you will incorporate these pieces into the game!